We are into our second week without Neva while she is studying hard at doggy training camp. We miss her terribly. I catch myself scrolling through puppy pictures on Instagram because I’m not sure how to deal with life without a dog, even though I know she’s coming home soon. Oh, but the truth is we are keeping ourselves entertained while Neva is at school. We figured a weekend trip to Crested Butte would be much simpler with just the humans. It’s sort of a casual drawn out celebration of our 20th anniversary. 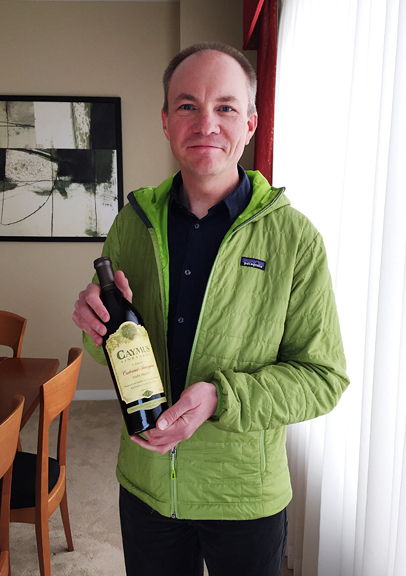 Dad instructed me to go to their place in Boulder and select any bottle of wine in his collection for us to enjoy, with the promise that they would celebrate with us this summer with “an even better bottle of wine!” I don’t really drink wine, so it’s actually a bottle of wine for jeremy. But I find it funny and sweet, because my parents are so very fond of him. 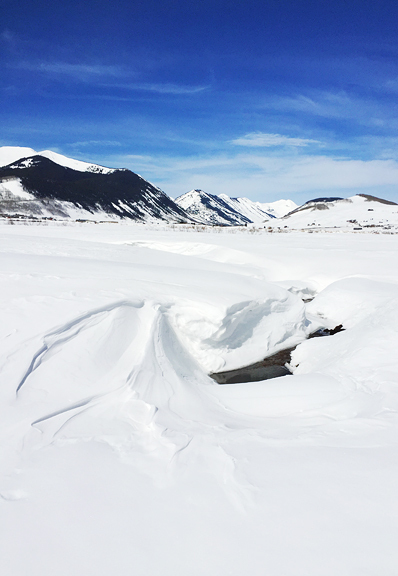 It was an oddly easy and strange weekend in Crested Butte. 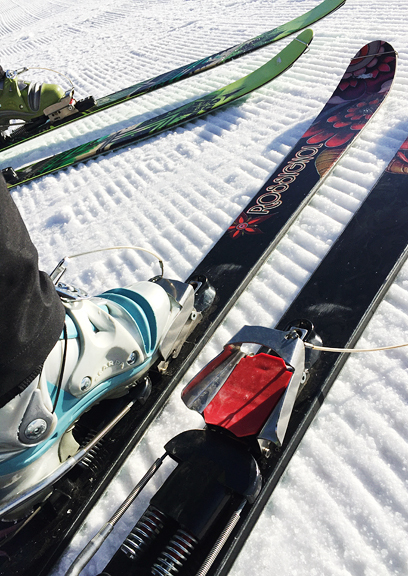 There was no new snow, but we didn’t feel like skiing groomers. Erin told me that we have become totally Coloradofied. 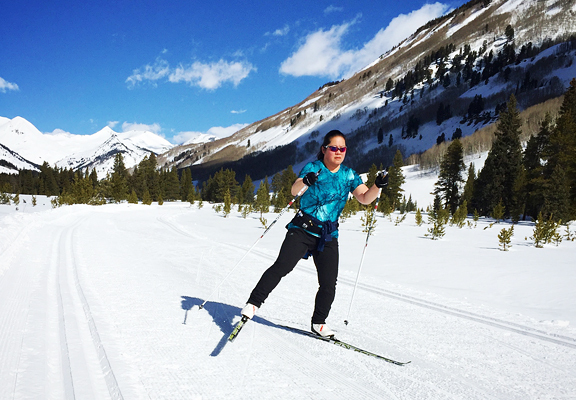 We skated and uphill skied, worked, and celebrated a friend’s birthday. And we both found ourselves muttering “I miss little Neva,” at random times throughout the days. Of course, with the Daylight Saving time shift, we lost an hour Sunday morning. That would have been fine except 1) we wanted to wake up early to uphill ski before hitting the road to go home and 2) we stayed up late watching an episode of The Great British Baking Show. 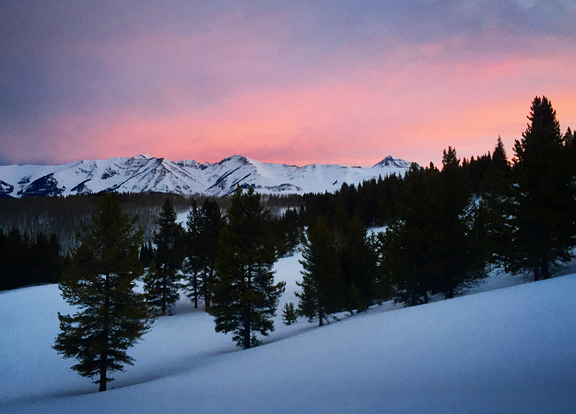 So we both felt particularly awful when my alarm went off at 5 am, but catching sunrise on the mountain was worth every bit of mental pukiness. I’ve been playing around with the sous vide when the mood strikes me and I have to say I just love this thing more and more. 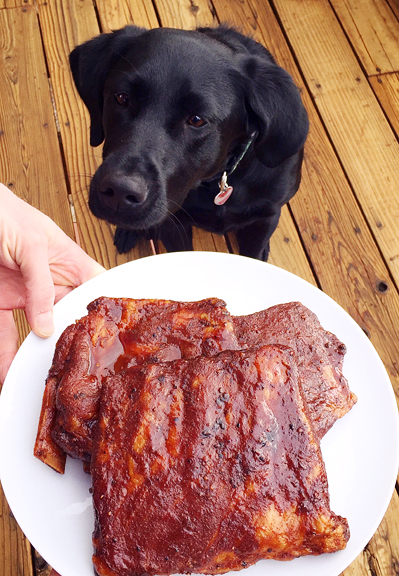 One of the first recipes I tried back in November was barbecue ribs. Kenji has a lot of great tutorials on Serious Eats, with plenty of clear explanations and options. The ribs turned out so beautifully, we had a dinner party just to serve the ribs to our friends (who also gave them the thumbs up). It’s quite simple as long as you have at least 12 hours to sous vide the ribs. I haven’t tried this on baby back ribs as I tend to prefer St. Louis-cut ribs because they’re meatier. 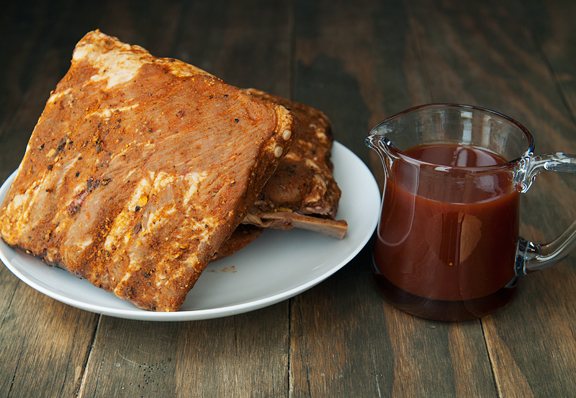 You merely need a rack or two of ribs, a dry rub, liquid smoke, and barbecue sauce. 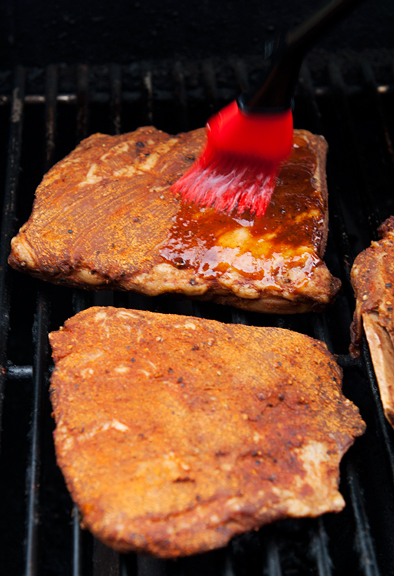 I list my favorite dry rub and barbecue sauce recipes below, but you can substitute your favorite versions – or if you’re short on time, you can purchase them. Kenji does have a way to achieve the pink smoke ring, but I find it completely unnecessary since it’s mostly aesthetic, so I skip that step. Regardless of whether or not you want a pink smoke ring, I think it’s worth giving his entire tutorial a once over if you’re serious about your sous vide ribs. Plus, it’s always good to learn things! 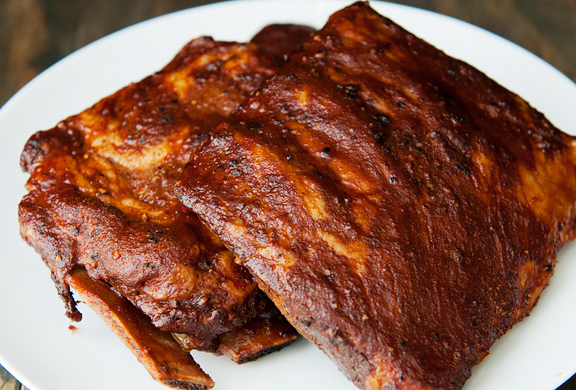 The main thing about these ribs is that you have to give yourself at least a day. This isn’t one of those recipes where you have a craving and then an hour later you are fulfilling that craving. No, this requires a little planning, which already disqualifies some people I know. The ribs need to chill with their dry rub and a little splash of liquid smoke for at least four hours, but I personally think twelve hours is better. Then, they sous vide for a minimum of twelve hours. Before you place the ribs in the water bath, you should make sure that they all fit in the vessel you’ve selected, or you can sous vide in batches. I use a tall stock pot which can accommodate five bags before they begin blocking the circulator’s intake. I’ve seen vertical racks that hold the sections like vertical file folders (kinda nice). For such a long sous vide, it is reasonable to expect some evaporation. You can minimize this by using a custom lid (one that allows the sous vide to poke through), aluminum foil (that’s what I used), or ping pong balls. Another issue over such a long sous vide is heat loss. We are all about energy efficiency here in the House of Butter. I experimented with various set ups like a large cardboard shipping box filled with foam insulation. The heated foam gave off a strong chemical odor (outgassing), which we were pretty sure was not good to be breathing. So we omitted the foam and kept it in the box, which worked pretty well. I imagine when I get more serious about this, I’ll develop a more permanent, energy efficient, and safe method. But back to the ribs! 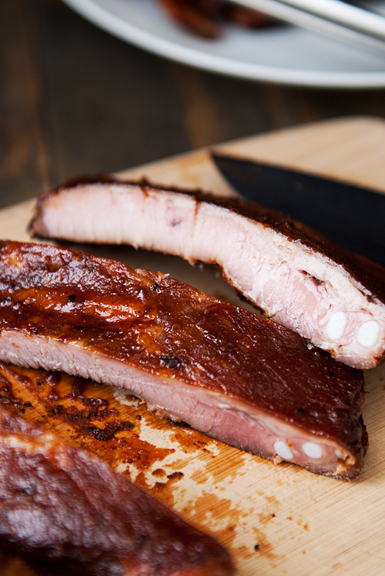 Once the ribs have been chilled, you can store them in the refrigerator for up to five days before finishing them off. For our party, I had three sous vide batches, but it was fine because I kept them in the refrigerator for a couple of days until we were ready to throw them on the grill. When you remove the ribs from the bags, there will be some gelatinous meat juices. 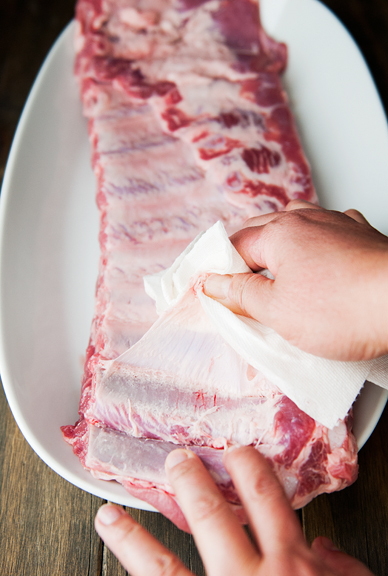 Wipe those off the ribs and discard them (I am guessing they will be incredibly salty). 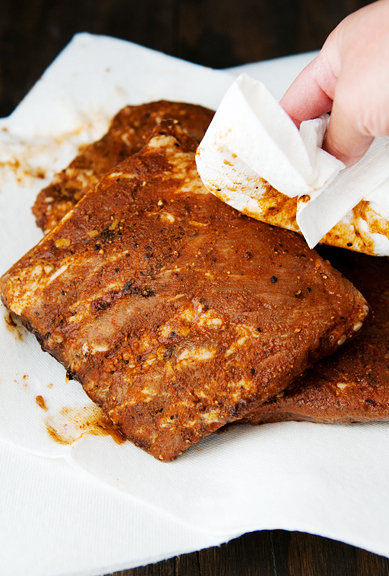 Blot your ribs dry with paper towels or kitchen towels and get your oven or grill ready. The key is to first heat the ribs through, then slather them with barbecue sauce (for dry-style ribs, please refer to Kenji’s tutorial) and let the heat dry the sauce onto the ribs before serving. What we get time and time again are perfectly juicy, tender, delicious ribs with meat that easily leaves a clean bone. We don’t usually sous vide large batches of anything, but ribs might be reason enough for me to invest in a larger sous vide plastic bin. Add this to another sous vide victory over a traditional cooking method! I am sold. 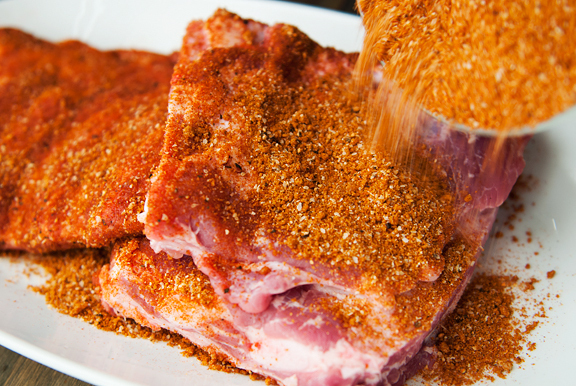 Make the dry rub: Combine all rub ingredients in a bowl and mix well. Make the barbecue sauce: Place all of the ingredients in a large saucepan and stir with a whisk to mix well. Bring the pot to a boil and reduce the heat to simmer. Let simmer for 10-15 minutes. Let the sauce cool. You can store it in a tightly covered jar or container in a refrigerator for up to two weeks. Makes 4 cups. 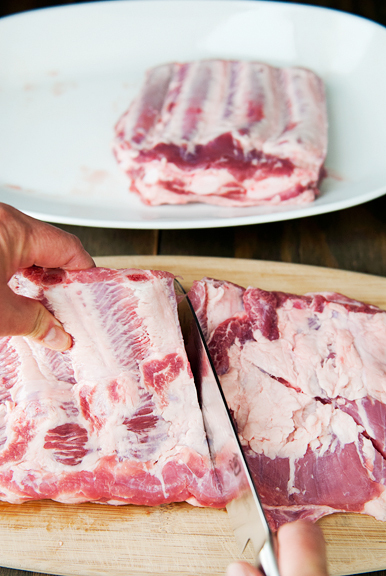 Prep the ribs: Remove the papery membrane on the backside of each rack. I start at the end with the largest bone and run the tip of a sharp knife lengthwise along the end bone until I can get enough of that membrane to hold. It helps to use a paper towel or kitchen towel for better grip (because it’s slippery) and slowly peel it off the rack. Cutting between the ribs, slice each rack into sections with 3 to 4 ribs per section. Rub each piece with your dry rub so that they are all well-coated. 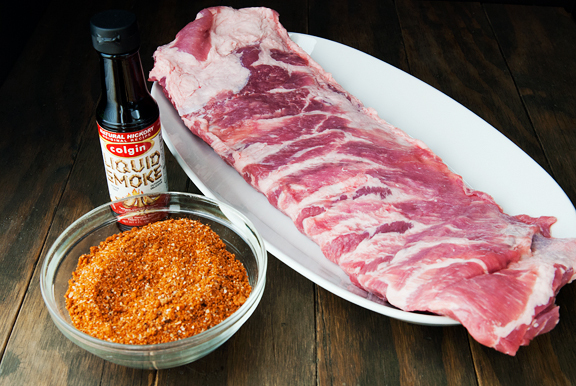 Put each section of ribs with four drops of liquid smoke into its own vacuum or ziploc bag, taking care to keep the edges of the bags clean (for proper seal). 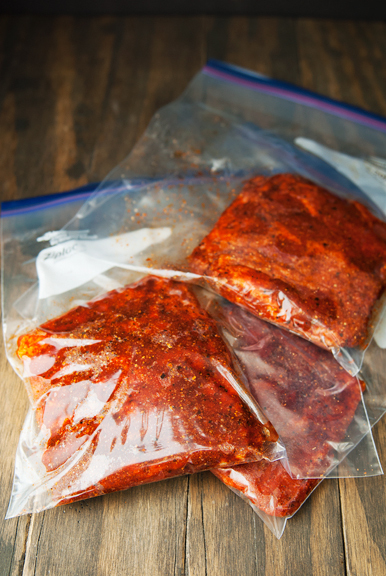 Seal the bags and refrigerate them for 4 to 12 hours (I went for 12). 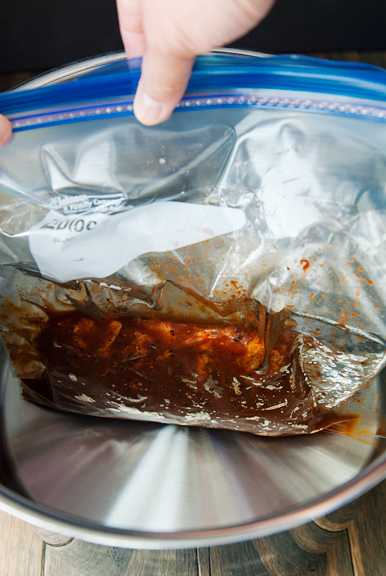 Cook the ribs: Set your sous vide device to 165°F. When the water bath has achieved the target temperature, add your vacuum-sealed bags to the bath. If using ziploc bags, take each bag one at a time and lower it into the bath to allow the water to push the air out the top of the bag until most of the air has been removed. This is the displacement method. Seal the bag without letting water or air in. Add the ziploc bags to the water bath. You can either set them on an upright rack (like a filing shelf that hold the ribs vertically) or clip the bags to the side of the vessel. I found that free floating bags tend to block the sous vide circulator. 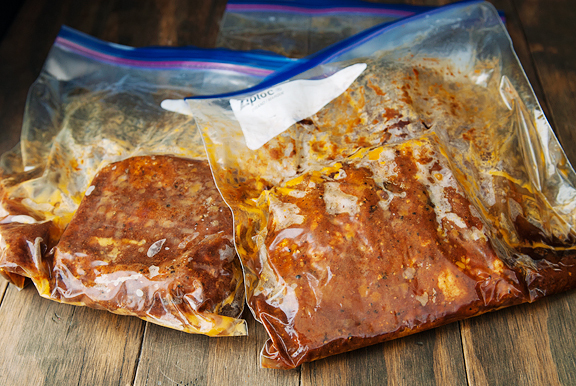 Cover the top with a lid or aluminum foil to discourage evaporation (it can still happen, so check periodically to make the sure the water level is above the meat). Cook for 12 hours. Remove the ribs to an ice bath to chill them through. At this point, they can be refrigerated for up to 5 days. Finish the ribs: You can finish your ribs in the oven or on the grill. 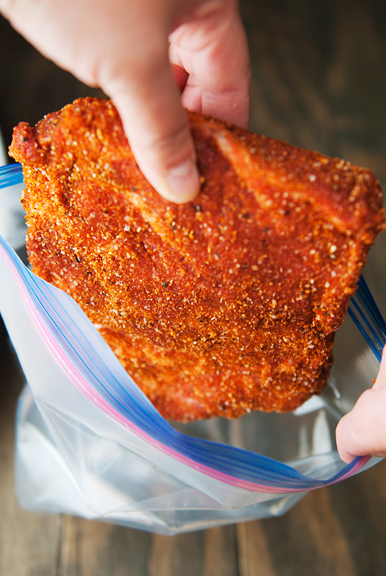 Remove the ribs from the bags and pat them dry. For an oven finish, preheat to 300°F and set the oven racks so they divide the oven into thirds. 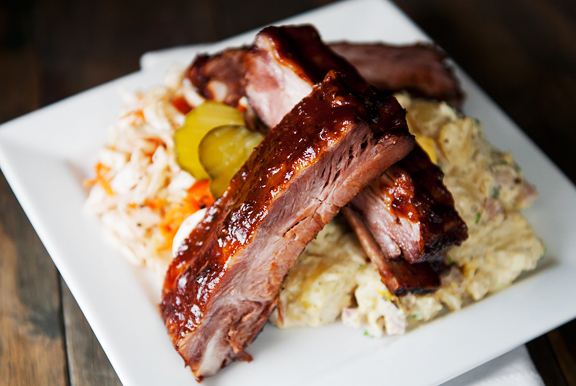 Set a wire rack on a foil-lined rimmed baking sheet for each whole rack of ribs you are cooking. Set the ribs on the racks with the meaty side up and heat them in the oven for about 20 minutes. Brush the tops with your barbecue sauce and cook for 10 minutes. Brush the tops again and cook for another 10 minutes until the sauce is sticky, but no longer wet. Serve with extra sauce. To finish on the grill, heat one side of your grill with hot charcoals or turn half of your gas burners on to medium heat. Cover the grill and allow to preheat, 5 minutes for charcoal, 10 minutes for gas. Clean the grates with a scraper and rub them up and down with an oil-dipped paper towel several times. Set the ribs on the cool side of the grill (indirect heat), meaty-side up. Cover and grill for 15 minutes. Brush the tops with barbecue sauce and move them to the hot side of the grill. Close the lid and cook another 7 minutes. Brush the tops of the ribs again and cover. The sauce should be sticky, but not wet after another 5 minutes. Serve with extra sauce. 1 full rack should serve 2-3 people. Those do look wonderful! We usually bake our ribs low and slow before finishing on the grill, but I am sure that sous vide would produce a much better product. 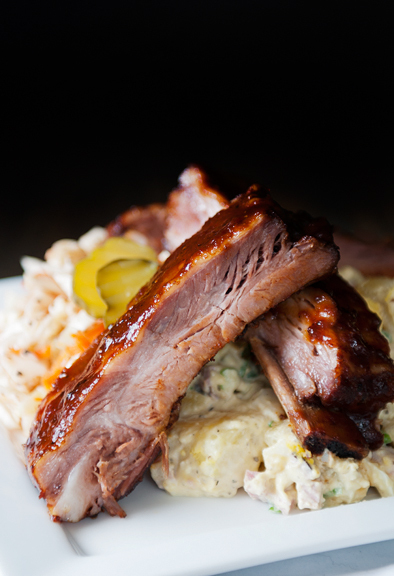 Of course, living in KC, it’s easier and tastier just to head over to Joe’s KC and eat their ribs! I use the same sous vide immersion circulator as you and have been cooking with it for a little over a year. I have used sous vide in conjunction with a smoker and had good results with ribs and brisket. Smoking for a very short time after sous vide, usually an hour or two at low temperature, got me great results in both cases. Energy usage can be a concern with the longer cook times as you mentioned. My brisket went for 48 hours, so I was concerned with that. 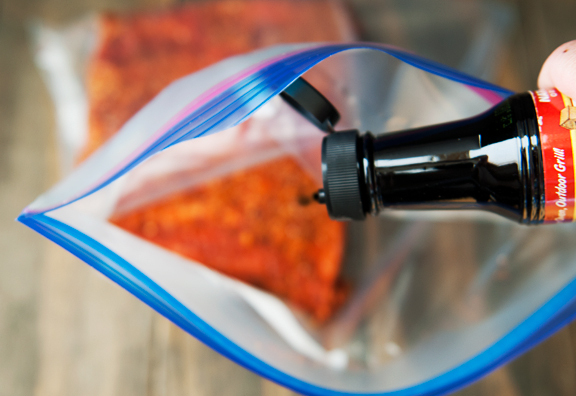 I’ve seen, but never tried, using a cooler for sous vide. Maybe that would be a solution to the heat loss. Another concern I had was the single use disposable plastic bags for the food. I’m switching to silicone reusables for that problem. Have fun with sous vide and keep up the good work. I made these last month too! They were so good. Try wrapping your container in bubblewrap. I use an 18qt Rubbermaid container that doesn’t transfer or retain heat, like a steel stockpot. I wrap it with several layers of large size bubble wrap. It retains the heat very well. I did a 72 hour short rib with it. 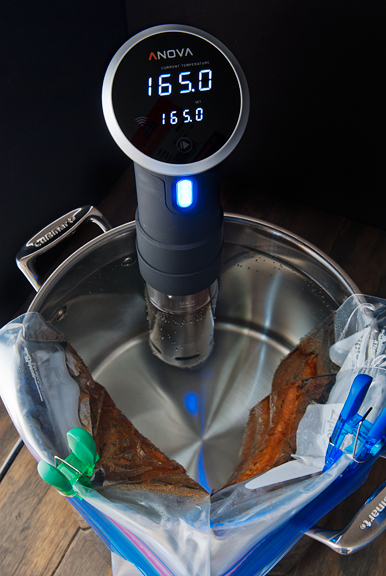 I have a Joule sous vide from Chef Steps….love it! Last week I’d did a pork collar…cooked for 18 hours and finished Under the broiler to brown up. Serious Eats is also a wonderful site! Even my husband, who was very leary of sous vide…is sold! I haven’t done anything that I wouldn’t do over and over. I’m so glad I took the plunge and bought this kitchen tool. Hey, if Thomas Keller uses sous vide..it’s definitely good enough for me! I’m loving your sous vide experiments! It’s awfully tempting to purchase one myself, but as I’m vegetarian, I’d have to conjure up enough recipes to make it worth the buck (though perhaps your cheesecakes would be worth it alone). Regarding GBBS, OH MAN. I’ve been so happy since Netflix put up that last season! Seeing Mary and Paul banter over a soggy bottom simply can’t be beat. Happy watching! How was the wine? We received a bottle as a gift but haven’t opened it. Bob Foster – Oooh, now you make me want to get a smoker… Sounds awesome. I think if I get serious about doing long cook times for sous vide, I will start researching methods for better insulation without the issue of the outgassing – I can smell the chemicals wafting into the air after an hour or so. Also, thanks for the silicone reusable tip! Carla – right?! Glad to hear you’re loving it, too!! R.C. – Ha ha! I think the cheesecakes are definitely a nice option, but I’ve started wondering about things like potatoes and other vegetables or non-meat foods in sous vide. If I come up with something, I’ll certainly post it here (actually, I’ll have a chocolate recipe soon). Jill – Well, her professional training is done, but we are working with her to get her to listen to US now :) She is doing really well – not perfect, but soooo much better than before!! Hi, I use a Rubbermaid 18qt container and bought a lid from Amazon that fits my Gourmia immersion cooker. I wrapped the container with hot water insulating pipe tape I bought from Home Depot for about 5 dollars a roll. It only took one roll to tape it up to the handles and tape the lid. With a temperature gun, I read 88 degrees where the tape is and 140 degrees where there is no tape while cooking chicken wings. I did a pork shoulder for 18 hours @ 165 degrees and lost almost no water to evaporation. I’m still very new to sous vide, but I love to cook and use my pressure cooker all the time and I’m always inventing new dishes and trying out new recipes. I really enjoy watching cooking videos on YouTube, it gives me ideas. I really enjoy your blog, I hope you keep it going and thank you for your recipes. Michael – Thanks for the tips! I really like that hot water insulating pipe tape (I didn’t know the stuff existed, and now I am unreasonably excited about it). You are probably already familiar with Kenji’s sous vide archives and guides over at Serious Eats’ The Food Lab. I think my biggest question is if I can somehow use something other than plastic for the vacuum bags – I like Bob’s suggestion of the silicone reusable bag and will have to look into it. Thanks for the comment!